club little house: SASHA: To paint or not to paint - that is the question! SASHA: To paint or not to paint - that is the question! In my family we have jolly good arguments about crafts. 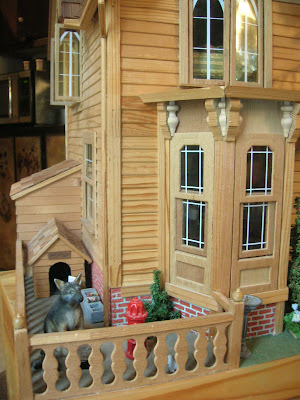 My father and I have been working on my dollhouse for years. Like June's, it swivels on a turntable that my dad made for it! As you can see, I haven't painted the outside of the house. I just can't decide on a finish. My mother likes it left "au naturel" but I think it should have a vintage-y stain to it, so it looks like it needs a paint job but the inhabitants are too bust throwing birthday parties and eating cakes. Which is, of course, the truth, but more about that some other day. In the meantime, the guard dog is in his fenced part of the yard... my dad carved him to look like our old German Shepherd, Bailey. I'll tell you a little something: if you turn Bailey's fire hydrant... the lights inside the house come on. See you all soon! I think I'm with your mom...I like the look of it as it is. Maybe you could do some sort of pickling stain technique. I also like your idea of giving it the "the paint is coming off my house and I don't care" (sung to the tune of jimmy cracked corn) kind of look. I love the dog in its little pen with his house and hydrant. And to think that hydrant turns on the lights in your house--how fun and clever! Follow your instincts about painting the house. I can see it gleaming with white paint and a lovely contrasting trim color. A pickled stain as Amy mentioned would be wonderful. It would also look nice with a rich wood gel stain. In the meantime, it looks fabulous just as it is, too. When the time is right in your own head and heart, then that's the day you'll make your decision about painting it. It's uber cute just the way it is. I would vote to paint it, but I don't even know what color to suggest. And don't think I'm not completely in love with that little carved dog. Oh, I just love it as is. I'm a fan of white house w/ black trim and red door. Not sure why... My dollhouse is mustard yellow---go figure!